International Women’s Day, March 8th, this year will be the biggest ever. Millions around the world will march and strike. Decades of brutal global neoliberalism and now Trump’s presidency have provoked unprecedented mass struggle and a new global women’s movement. On March 8th, in more than 50 countries there will be strikes and student walkouts in support of women’s rights, equal pay, to defend abortion rights and against violence against women. Many will also use this day to protest Trump’s right wing racist and sexist agenda – from his new extremely racist Muslim ban to attacks on LGBT rights, migrants and refugees. Dictatorship’s like China’s are not wrong to fear the angry voice of women – because on this day 100 years ago the women of Russia went on strike against the world’s then most bloodthirsty dictatorship, of Tsar Nicholas, and a week later he was overthrown by revolution. 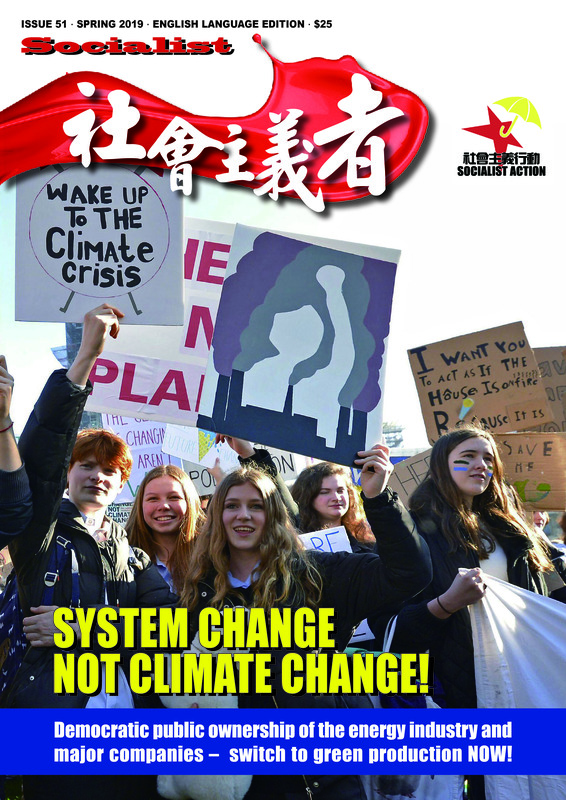 In Hong Kong, we organise this demonstration as part of the global day of protest on International Women’s Day. We are women from different ethnic and religious backgrounds, including refugees, migrant workers and local women, to fight for our basic rights, against sexual violence and oppression. Today, IWD, we go to the streets – not to go shopping or organise dinners and ceremonies. We want a new fighting feminism against the rule of the undemocratic billionaire 1 percent. And IWD is when our voices most need to be heard. This year’s historic global IWD protests have grown out of last year’s huge national movements of women in Poland, Iceland, Argentina, Ireland and now also the US. 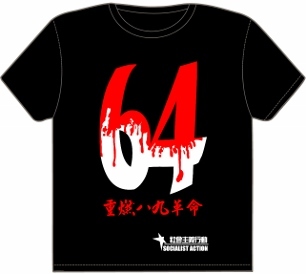 In China, feminists have faced repression, arrests and censorship. They are banned from publicising the international women’s strike today. Dictatorship’s like China’s are not wrong to fear the angry voice of women – because on this day 100 years ago the women of Russia went on strike against the world’s then most bloodthirsty dictatorship, of Tsar Nicholas, and a week later he was overthrown by revolution. 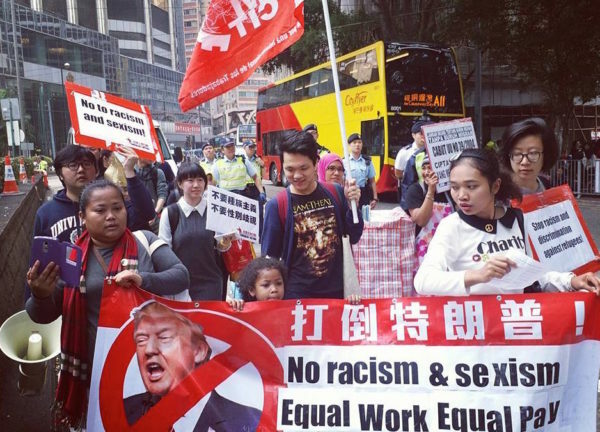 Hong Kong demonstration on 5 March 2017, supporting migrant women workers. 1 in 3 women in the world have suffered sexual or physical violence according to a UN study. Women around the world are rising up against this violence and the power structure – unjust laws, sexist politicians and rulers, systemic discrimination – that fosters such violence. In Argentina last year, a 16-year old girl was raped and killed, which caused a massive 1 million-strong protest movement and women’s strike. 70 percent of the world’s poor are women. Globally women’s wages are only 50% of men’s. In Hong Kong there are twice as many women than men living on an income below HK$5,000 per month. Our protest calls for increased public spending on welfare and social services, job protection and economic independence for women, and a universal pension system. International Women’s Day has been manipulated by capitalist society to boost consumption and shopping – a day to buy flowers for the ladies, or to promote a discounted plastic surgery! We are reclaiming this day as a day of struggle against the system of oppression. We oppose racism and discrimination of any religious group and oppose the inhuman treatment of refugees in Hong Kong and now also by Trump. It began as and must again become a day for working women, for the 99% – women, men and transgender – who are systematically cheated and exploited by governments of the billionaire 1%. We stand for a grassroots, anti-capitalist feminism and united struggle to defend wages, worker’s rights, public services, the right of asylum and the environment. March 8th solidarity with the global women’s strike! End women’s poverty! Equal pay for women! Universal pension system – tax the rich! Stop Trump, stop sexism and violence against women!